Genie TZ34/20 = A fantastic little machine allowing access to those high to reach places, this machine is a trailer mounted unit and is available for dry hire, The TZ 34/20 is rugged and heavy-duty, yet lightweight enough to use on lawns, slate or gymnasium floors. It has an extension boom with self-leveling platform, and a variable-speed control system to allow highly controlled maneuverability. Hydraulic outriggers are equipped with outrigger interlocks and illuminated outrigger indicators. The turntable has a 359˚non-continuous rotation. AC power to platform with a tilt alarm/sensor and forklift pockets. It also features dual pneumatic jockey wheels for precise positioning during setup. 2. Manitou 160ATJ – The Manitou 160 ATJ+ diesel-powered articulated platform has a loading capacity that is unique on the market: 400 kg. It can hold 3 operators and up to 160 kg of material. It has an up and over clearance of 7 m and provides a working height of up to 16.25 m and a horizontal outreach of more than 10 m.
Equipped with a large platform with three entrances and plenty of storage space for equipment, the 160 ATJ + is really suited to work requiring several operators. 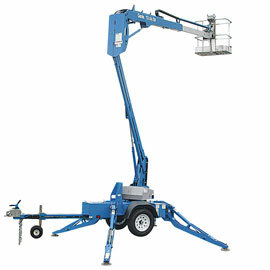 This articulated access platform is suitable for all handling and maintenance work. Its high ground clearance combined with 4-wheel drive and steering will allow you to clear obstacles and as a result work outdoors on uneven and difficult ground.